The Rochester & Strood by-election is still over a month away, but this week’s council by-elections gave Ukip a chance to remind the Conservatives of how powerful a force they are becoming in that part of the country. A rare appearance for the Monster Raving Loony Party in a council by-election! The ward lies within the constituency of Sittingbourne & Sheppey, currently held by Gordon Henderson for the Tories with a majority of 12,383. I doubt Henderson will be in any danger from Ukip at the general election, but the result in Swale will buoy the Ukip campaign in Rochester no end. They will particularly relish the timing of this victory, occurring the very same day that David Cameron made the first of a reported five campaigning visits to Rochester. But things didn’t go entirely Ukip’s way this week. 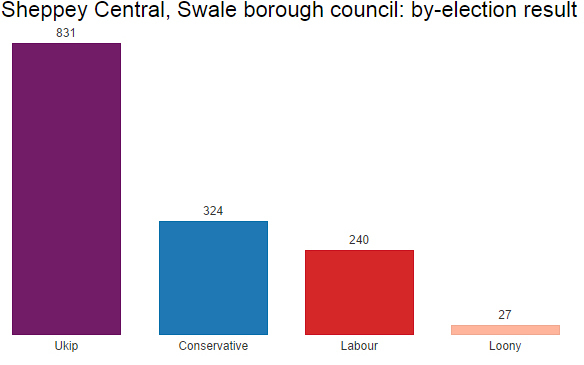 There were a total of 10 council by-elections on Thursday, and Swale aside, Nigel Farage’s party did not show much evidence of gaining momentum from last week’s success in Clacton and near-success in Heywood & Middleton. 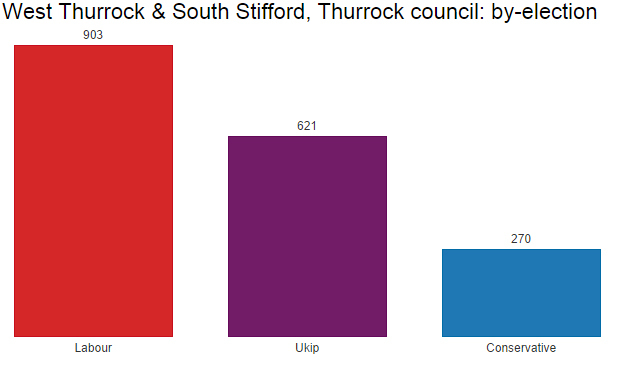 Of particular note is the result from a by-election for Thurrock council: a constituency Ukip is hoping to take at the general election, and where the sitting Tory MP Jackie Doyle-Price has a majority of just 92 over Labour. Thurrock was the scene of one the shocks of this May’s local elections, when the council unexpectedly slipped from Labour into no overall control. The party will be very relieved it both held this seat and fought off a Ukip challenge. Elsewhere, the Liberal Democrats took a seat on Rutland council from an independent, though admittedly the independent in question was not standing again, the only other party in contention was the Conservatives, and only 371 people voted (the Lib Dems winning 192, the Tories 179). The rest of the by-elections saw no changes. The Conservatives’ Laura Knightly defended a seat on Conwy council caused by her father’s death. She was opposed by no fewer than four independent candidates, plus Labour, but saw them all off. The Tories held seats in Fenland, Rossendale, Rutland (in a contest separate to the one above) and Kingston-upon-Thames, although the latter saw a 4.6% swing from Conservative to Liberal Democrats. Kingston was the one London council won by the Tories from the Lib Dems in May’s local elections. Ukip came second in Fenland, third in Rossendale, fourth in Kingston-upon-Thames and didn’t stand in Rutland. Meanwhile Labour held a seat in Bolton and the Lib Dems held a seat in York. The Press Association’s analysis of seven comparable results this week suggests the two top parties are projected to be neck-and-neck nationwide, with Tories ahead by a fraction of 0.1%. A calculation based on four seats fought both times by the three main Westminster parties gives a line-up of: Conservative 34.0%, Labour 29.2%, Liberal Democrat 21.8%. The Lib Dem seats in full: how far down the list will the Tories and Labour go?